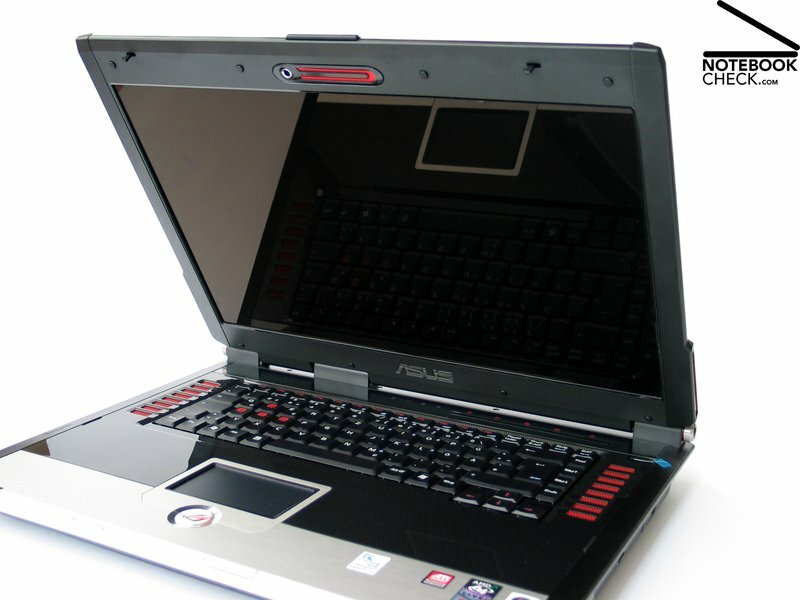 Affordably cheap gaming pleasure for consumers is the aim of the Asus G2K. The visually outstanding 17 inch desktop replacement has a very bright display and a wide range of interfaces such as HDMI and S-ATA ports. 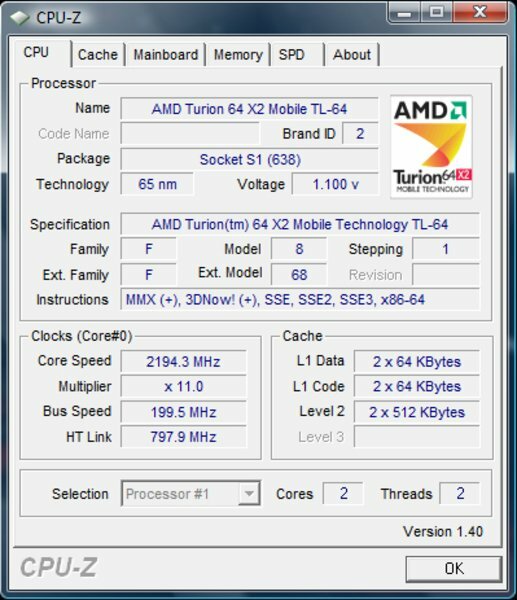 An AMD Turion 64 X2 CPU with 2.2 GHz as well as an ATI Mobility Radeon HD2600 graphics card take care of the performance. 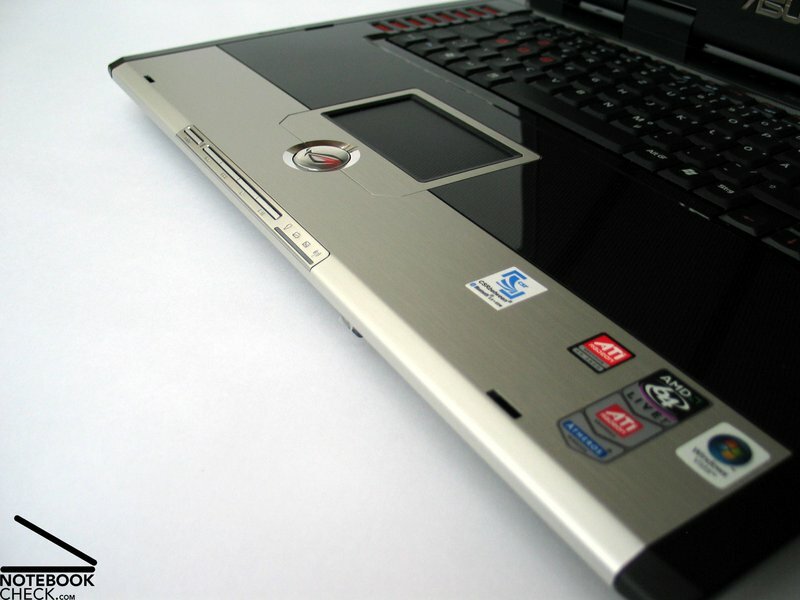 You will find out how this notebook is going to performance against its competitors equipped with Intel CPUs and nVidia GPUs in the following. 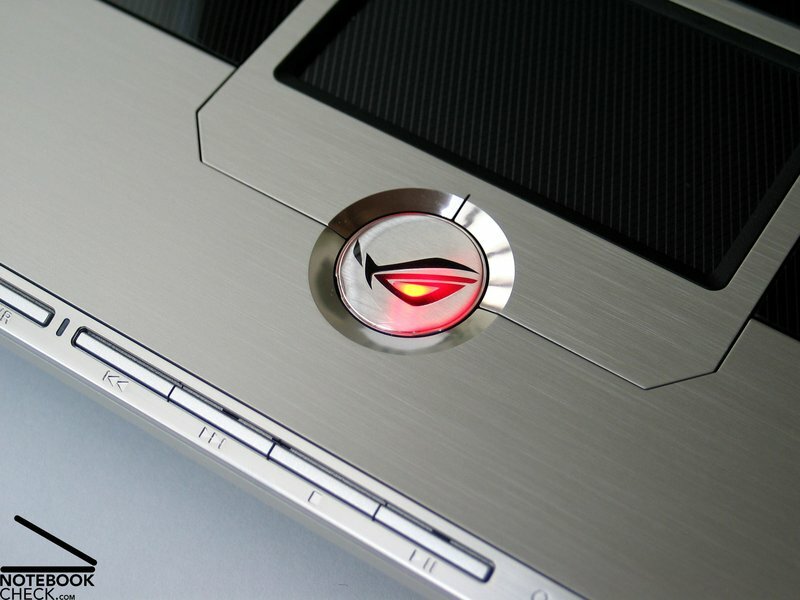 The Asus G2K is already the third model of the G2 series that we were able to look after. 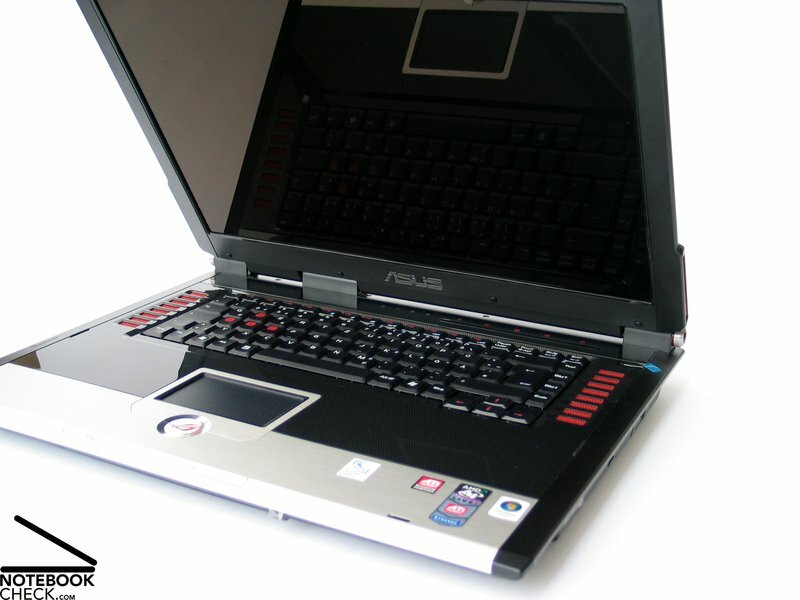 After the first encounter of Asus' 17 inch gaming series on the CeBit 2007 in Hannover (Asus G2P) we could take a look at its successor, the Asus G2Pc in a detailed review shortly afterwards. 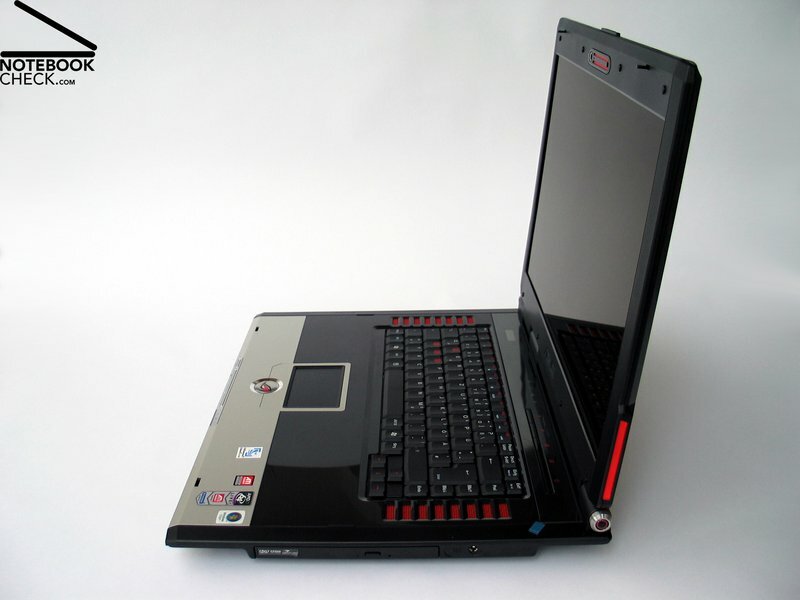 One thing did not change since then: the design of the laptop. Like on the first day, red chassis perforations and red pulsar lights the case, which tries to please consumers with a range of different optics. One example we could present would be the aluminium display cover or the very shiny surface of the base unit presenting a square pattern. The front side edges are finished with a shiny aluminium frame. The mildly reflecting case of the Asus G2K is obviously targeted at gamers. The joy is apparently increased by the flashing red lights at the display's edges. Those who find this feature less useful can simply deactivate the lights by using the "Asus Direct Console". 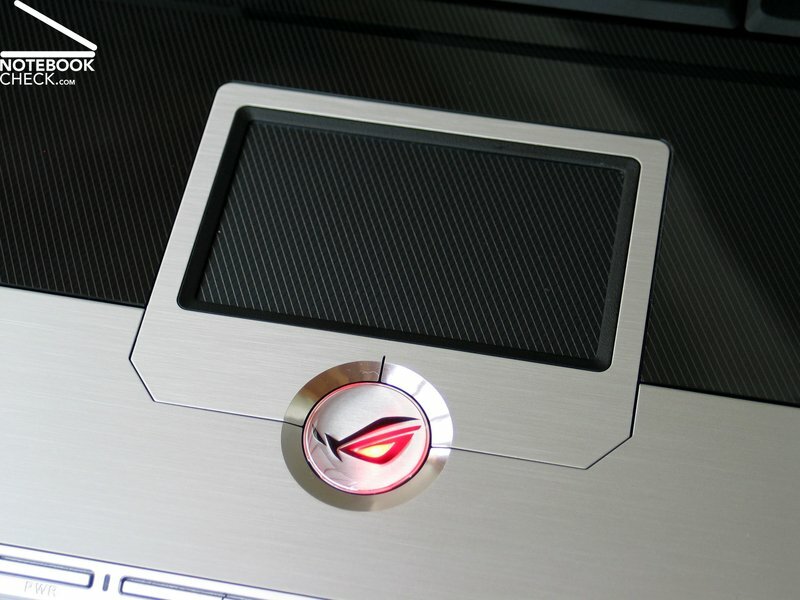 In terms of finishing, the Asus G2K is as competitive as its colleagues. All hinges and corners are very neatly built and cracking parts are nowhere to be found. The overall aesthetics come out very interestingly. This reaches from metallic cool to futuristic smooth up to the less attractive plastic flair of the display cover. The case does make a solid impression. No deformation of the G2K could be noticed when pressure was applied onto the chassis. 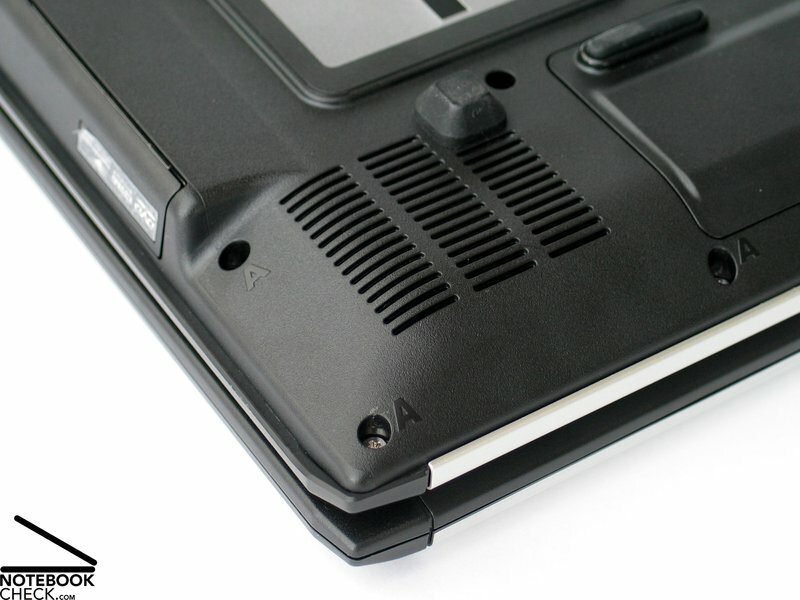 Only the plastic surface of the DVD drives on the bottom side deformed slightly on its very top. Also the pressure resistance of the display can be described as decent. 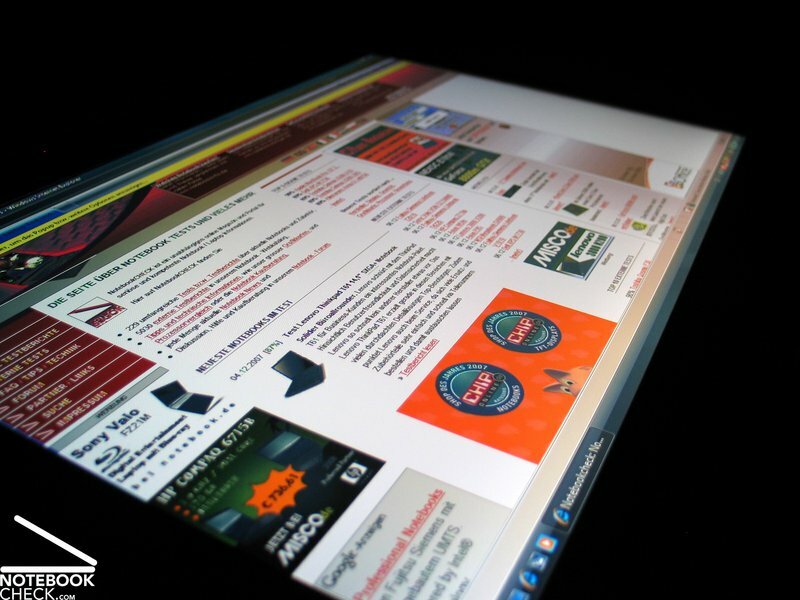 The 17 inch display is hold by two very individually designed hinges that seem to keep the display very safe and sound. The practical test reviewed that the panel did not wobble in a noticeable way and the pressure resistance of the display can be described as sufficient. 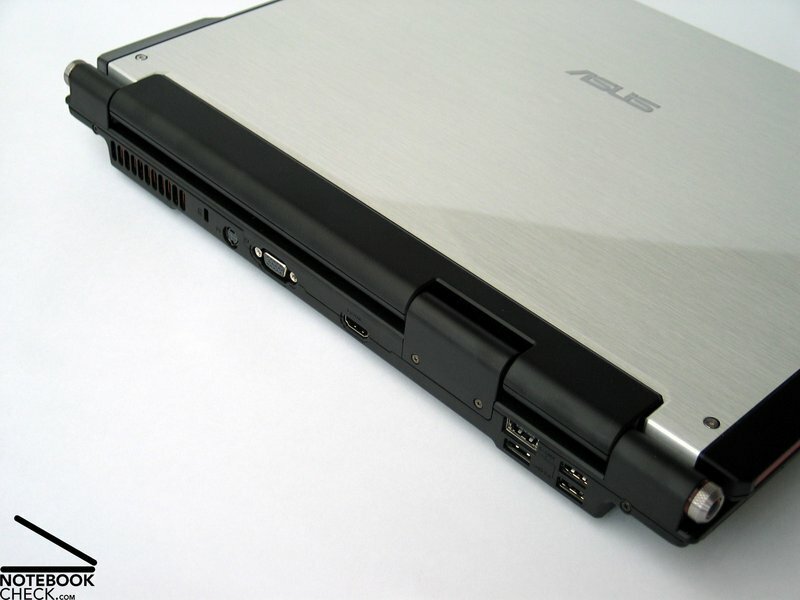 In terms of the interfaces, this laptop offers a Firewire port, an analog VGA output, S-Video port and a HDMI port for the rendering of digital audio and video signals. There is also a DVD drive on the right side of the G2K that is capable of the LightScribe so that suitable disks can be written on. 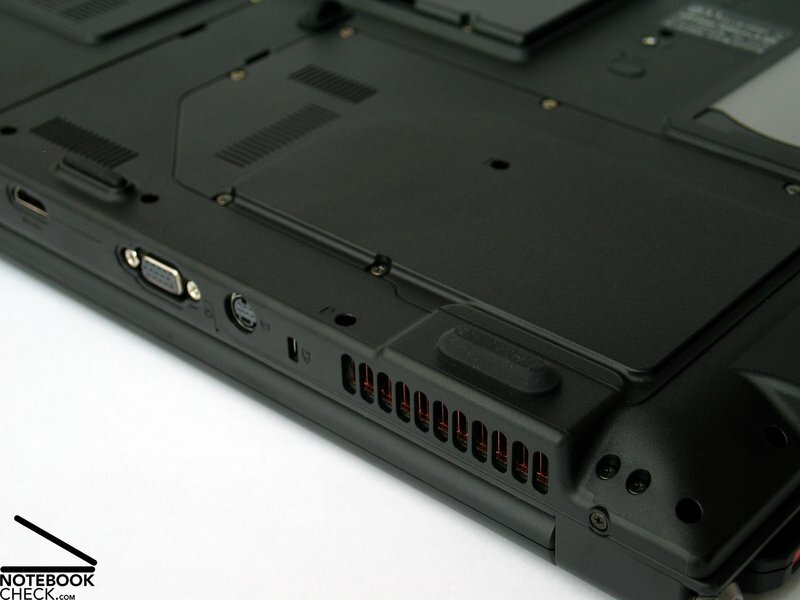 The majority of interfaces are to be found on the back of the laptop resp. on the left rear side. This will help to reduce possible difficulties with external devices, which is optimal for the desktop replacements. For those using video conferences and other little gimmicks, the G2K has a built-in 1.3 megapixels webcam on the top of the display. 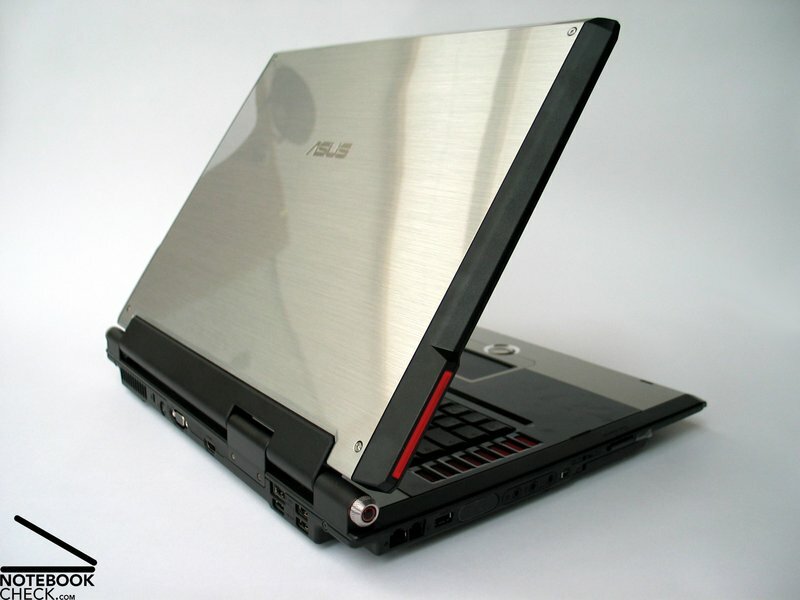 Trademark of the Asus gaming laptop series G1 and G2 is the outstanding design especially owing to the red A-W-S-D keys, the most important keyboard area for gamers so to speak. These keys are used to guide the game character of to control specific objects within a strategy game, which is the reason why it actually is a good idea to highlight these keys from the rest. The layout of the keyboard and its nice and big keys were mainly responsible for the lack of an additional num pad. Despite the fact that the keys are put together in a narrow way, we did not find any evidence of problems arising from this. Besides, the ergonomics of the individual keys can be described as pleasing even after a long round gaming round. The keys can be pressed easily and present a nicely noticeable pressure point. They can also handle harder strokes that however will result is a deformation of the keyboard mainly around the enter key followed by clicking noise. 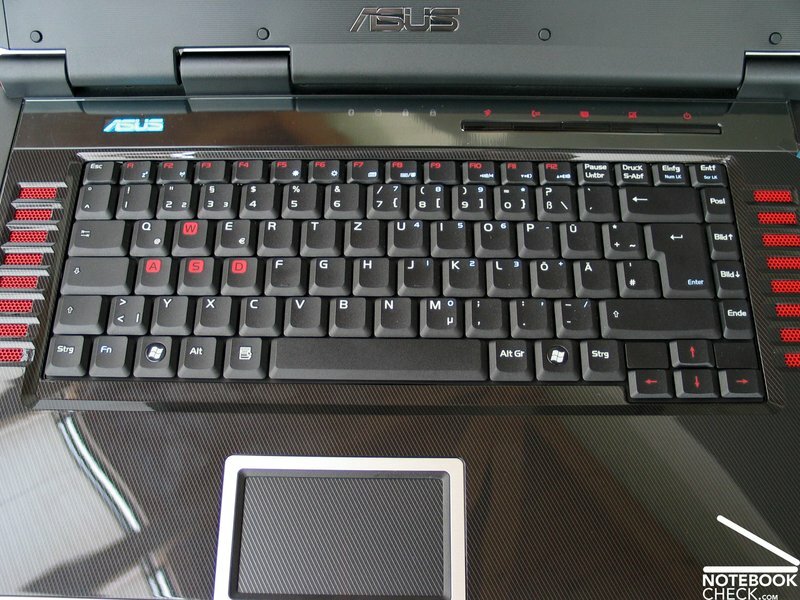 The Asus G2K also provides the user with two rows with additional keys; one is located on the front side of the laptop where one can control the Media Player and one is put on the right top behind the keyboard. These hot keys can be used for example to deactivate the touch pad or to show the performance index. Nevertheless, the volume can only be changed via the Fn key and the matching hot key. 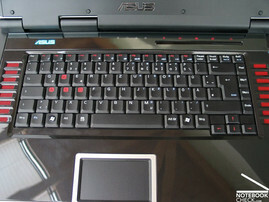 The touchpad is easy to use, so are its keys, which are separated by a glowing Asus G2 logo. There is not a scroll bar on the touch pad but this is solved when using the excellent mouse included. 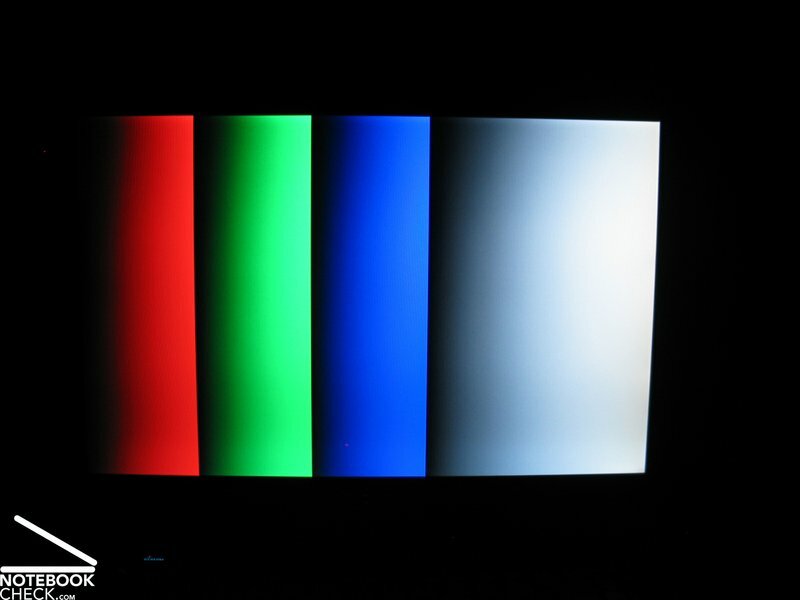 Our test model had a WXGA+ panel with a resolution of 1440x900 pixels. 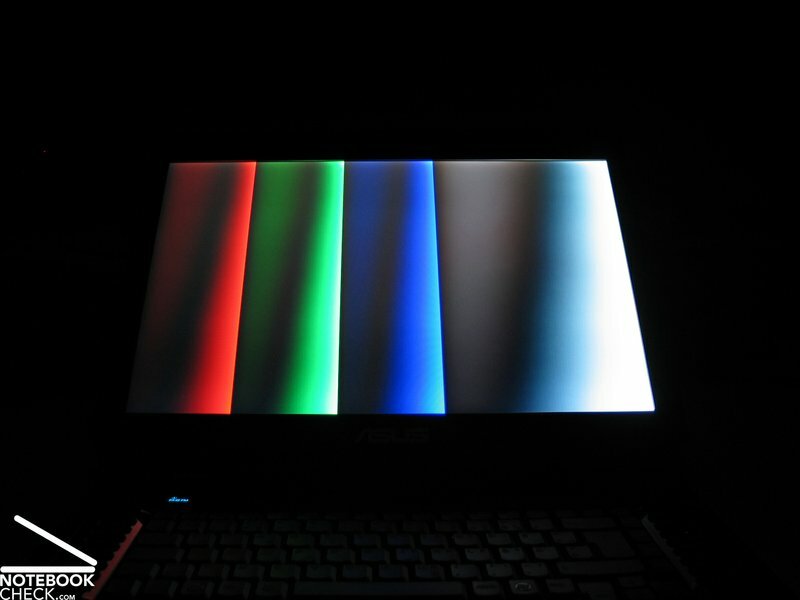 The display (that is called as "Color Shine Glare Type LCD Panel & High Brightness") had a reflecting surface delivering a colourful and bright image. The resolution is on the threshold of being too low since icons and texts are already fairly big on the desktop. However, this might be good for those working at a greater eye distance to the screen. We measured a maximum brightness value of 336 cd/m² in the central area of the display. Despite a drastical fall of the brightness down to a minimum of 226 cd/m² in the upper left, the average brightness level of 276 cd/m² is still very good. The illumination of only 67.3% however reduces this advantage to a certain extend. The recorded minimum brightness level (black value) of 0.7 cd/m² results in a very good contrast of 480:1. The display is both visually very nice to look at and to work with. 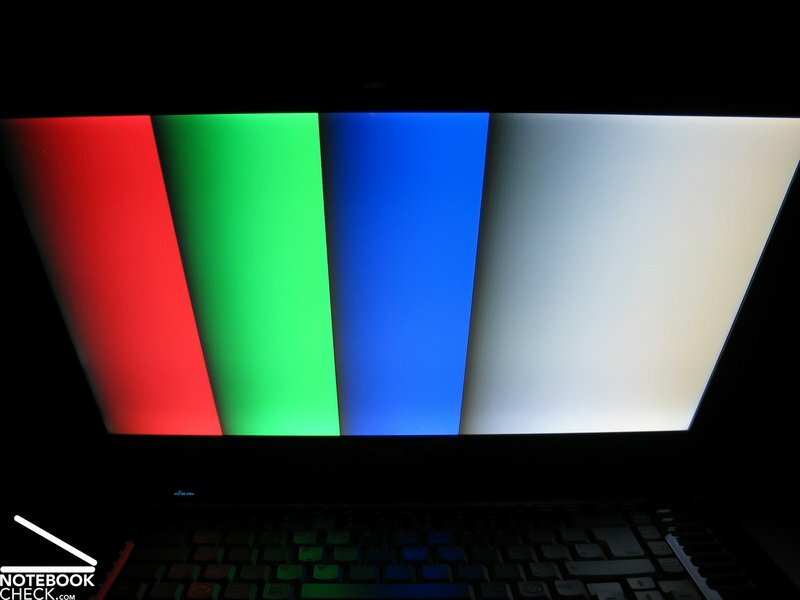 The high brightness level could also allow outdoor use of the laptop but this is countered by the highly reflecting panel that can create very strong light reflections under certain viewing angles. Furthermore, the weight of 4 kg does not really allow frequent use of the G2K as a mobile device. Regarding the stability of the viewing angles, the G2K again performs quite well. There is a strong deviation in the vertical area creating reflections and little colour changes. The vertical viewing angle is alright, too; the screen darkens and lightens quite a lot depending whether looking from the bottom up or from the top down on the screen. Although most laptops are equipped with Intel CPUs combined with nVidia GPUs nowadays, the Asus G2Kfor instance has an AMD processor and an ATI graphics card. This equipment seems to be coming from one house after the two manufacturers merged together. How this combination is going to perform against the rival one is explained in the following paragraphs. 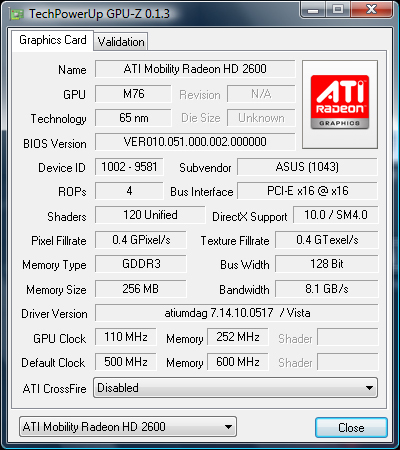 With the aid of the 3D Mark 2005 and 2006 benchmarking tools, we could make out that the ATI Mobility Radeon HD2600 graphics is on the direct level of the Geforce 8600M GT. While this ATI GPU is quite a couple of frames slower in the 3D Mark 2005, it performs a lot better in the 2006 benchmark against the nVidia card. 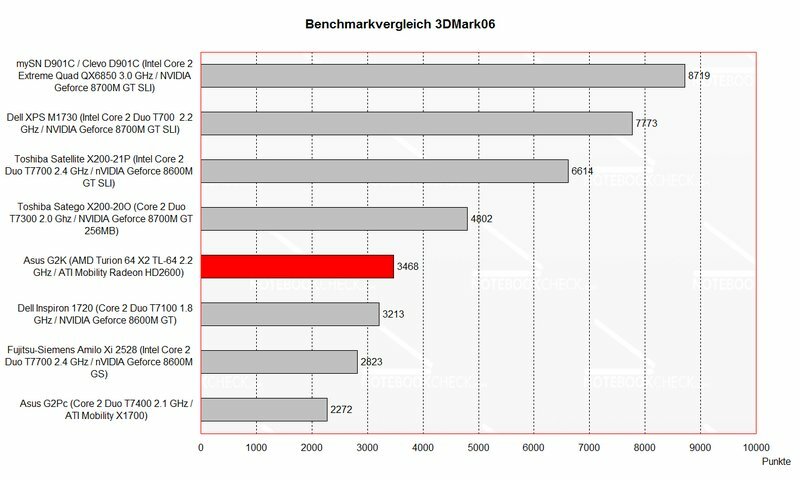 The AMD/ATI combination is slightly faster than comparable laptops using 8600M GT graphics cards but is a lot slower than ones equipped with 8700M GT Grafik cards. Well, how does this actually affect real life gaming? 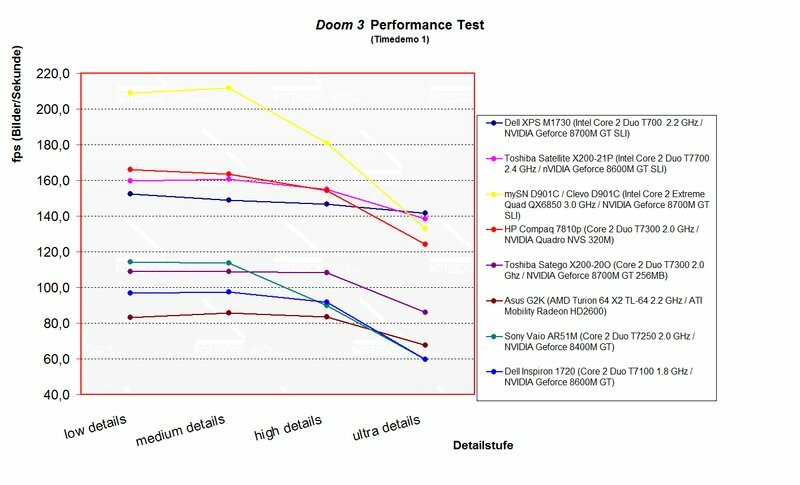 In the Doom 3 benchmark, the G2K was on the same level as laptops with GeForce 8600M GT graphics cards. 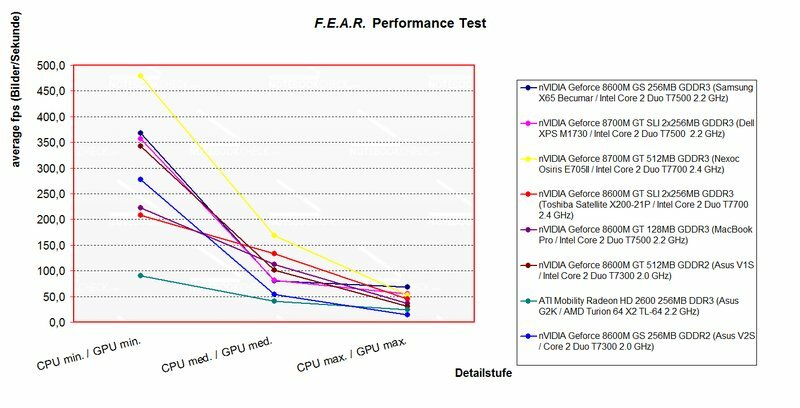 Laptops using GeForce 8700M GT GPUs and partly some SLI solutions are still significantly faster. The HD2600 graphics card is able to attain highly sufficient frame rates of 70 per second in "Ultra High". However, the card performed slightly worse in the DirectX 9 first person shooter F.E.A.R. in comparison to a GeForce 8600M GS. Surprisingly the GPU seems to struggle especially with lower details, which could be due to the less powerful processor. 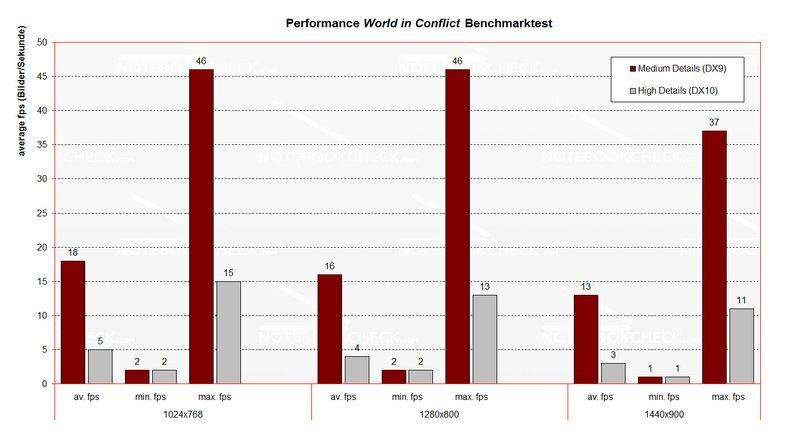 Current DirectX 10 games such as Crysis or World in Conflict were hardly playable. The results extracted from the demo versions were all very disappointing. Even when playing on minimum quality and resolution, it was very hard to play. World in Conflict ran with acceptable frame rates (30-40fps at 1440x900px and 30-60fps at 1280x800px) in medium details and DirecX 9 effects on a 2 vs 2 multiplayer match. Short lags could be noticed during demanding in-game animations. Besides this, all resolution modes and detail options caused annoying graphic errors (white stripes) in World in Conflict that made playing very frustrating. We assume that this is due to difficulties within the installed ATI driver (version 8.401). 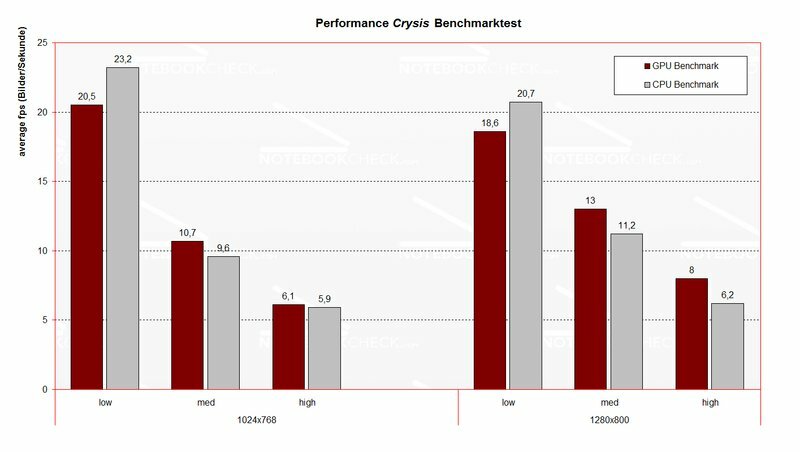 When you compare the ATI Radeon Mobility HD2600 directly with an nVidia GeForce 8600M GT graphics card for example the Asus G2K and the Zepto Znote 6224W, the AMD/ATI combo is noticeably slower in the Crysis benchmark. 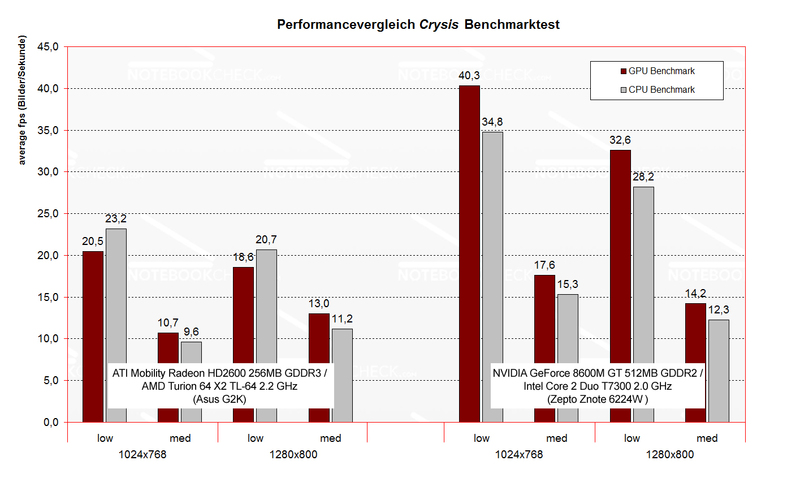 Both the CPU and GPU were slower than the competition (Intel/nVidia). 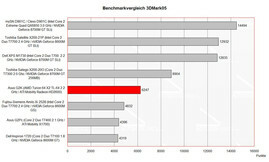 Also when regarding the application performance, the G2K only delivered less impressive results. 4242 points is far behind comparable DTRs and even behind the G2Ps version of the same gaming range. It needs to be mentioned that the latest Futuremark hotfix was required for both the 3D Mark and the PC Mark 2005. 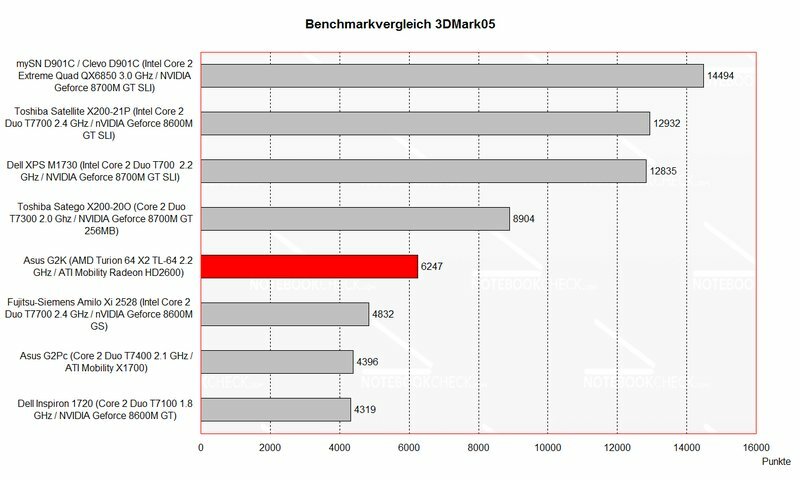 The Cinebench R10 also delivered average results that are due to the relatively slow AMD processor. 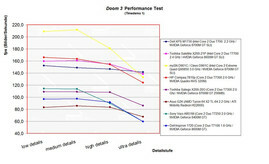 These results were behind Intel's T7500 CPU (2.2 GHz) as well as even the T7300 (2.0 GHz). 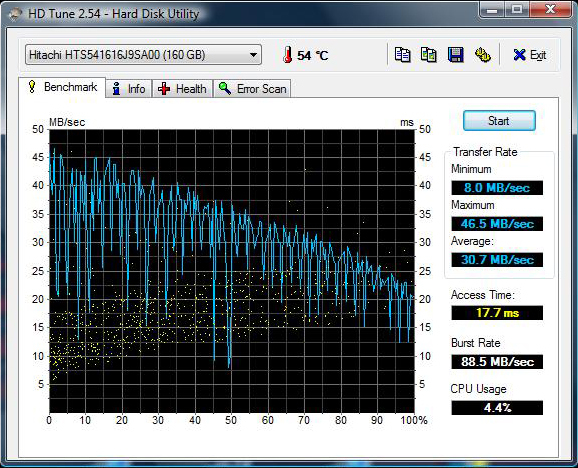 However, in terms of the hard disk's performance, we can say that this 160GB HDD presenting an average speed of 5400 rpm was pretty competitive. Furthermore, the 11.7 ms reaction time and the data transfer rate of 46 MB/s were quite good, too. 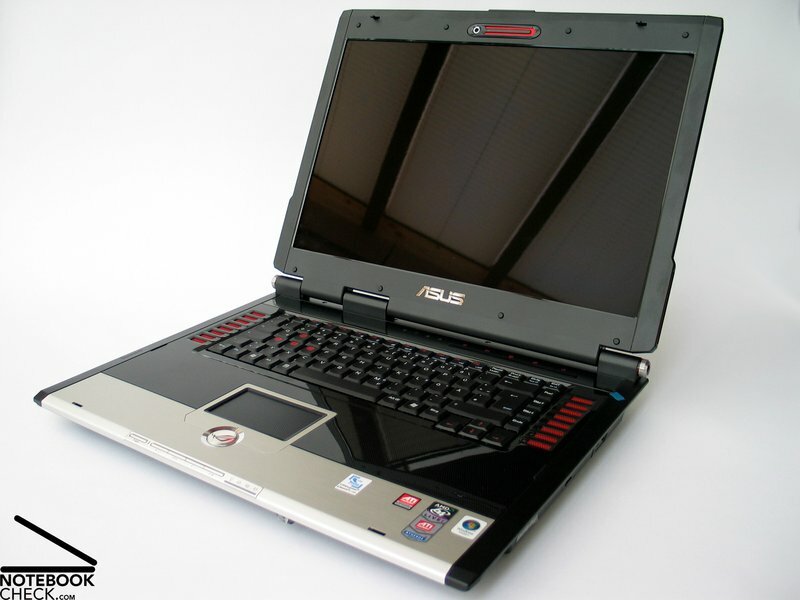 When taking a look at the noise levels produced, the Asus G2K created quite serious competition for the already reviewed Dell XPS M1730 gaming laptop. Apart from a very insignificant background noise, the device is hardly noticeable in idle mode. The fans can be heard clearly under load but with a maximum of 41.5 dB, the noise level is always acceptable. The case temperature of the Asus G2K is the opposite of the good loudness result. We were able to identify maximum temperatures up to 47.2 °C on the bottom side. The top presented only slightly cooler picture: 44.7 °C is anything but nice to work with. 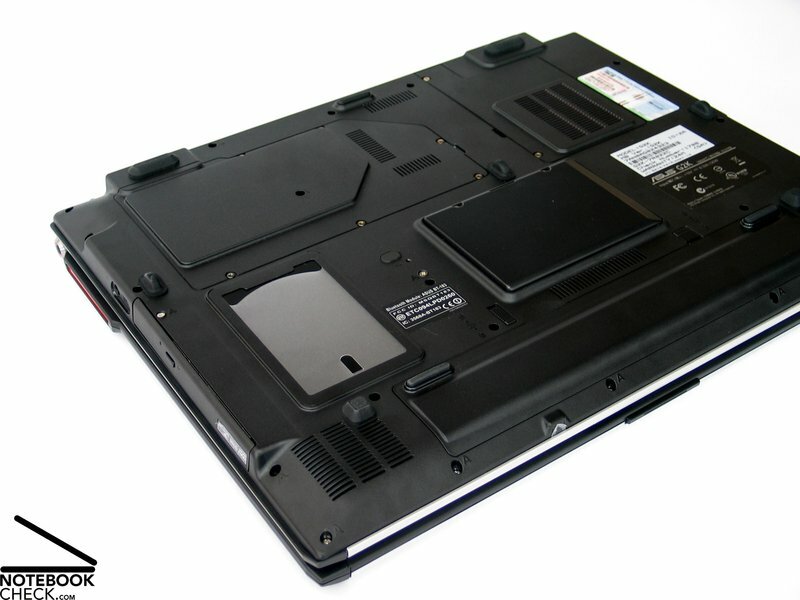 When examining the case of the laptop, that the reasons for these high temperatures are the relatively small fan holes and the tiny circulation cracks on the bottom side. To which extend this is responsible for the recorded temperatures can be discussed. (±) The average temperature for the upper side under maximal load is 37.5 °C / 100 F, compared to the average of 32.9 °C / 91 F for the devices in the class Gaming. (±) The maximum temperature on the upper side is 44.7 °C / 112 F, compared to the average of 39.3 °C / 103 F, ranging from 21.6 to 68.8 °C for the class Gaming. (-) The average temperature of the palmrest area of similar devices was 28.7 °C / 83.7 F (-4.5 °C / -8.1 F). 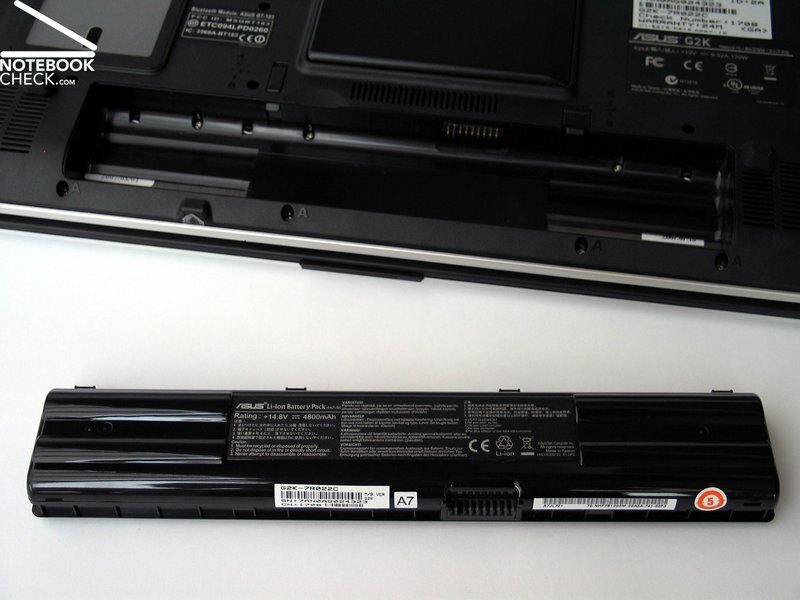 The two built-in loudspeakers that are placed on the bottom top side of the device produce fairly passable sound and surprisingly acceptable bass, which is quite rare in the laptop scene. 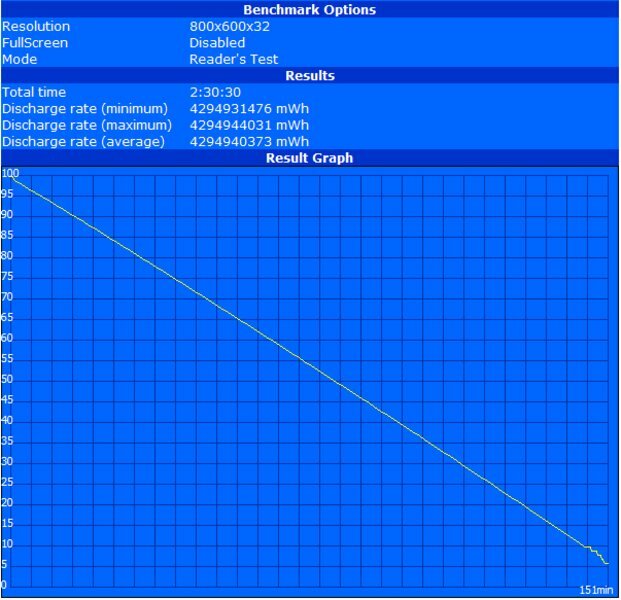 The 4800 mAh (69 Wh) lithium ion battery helped the DTR to run from one hour under full load up to 2.5 hours in idle mode. This laptop places itself in the lower ranking of mobile desktop replacements. However, this device is usable for some simple office applications and WLAN Internet that do not create load. 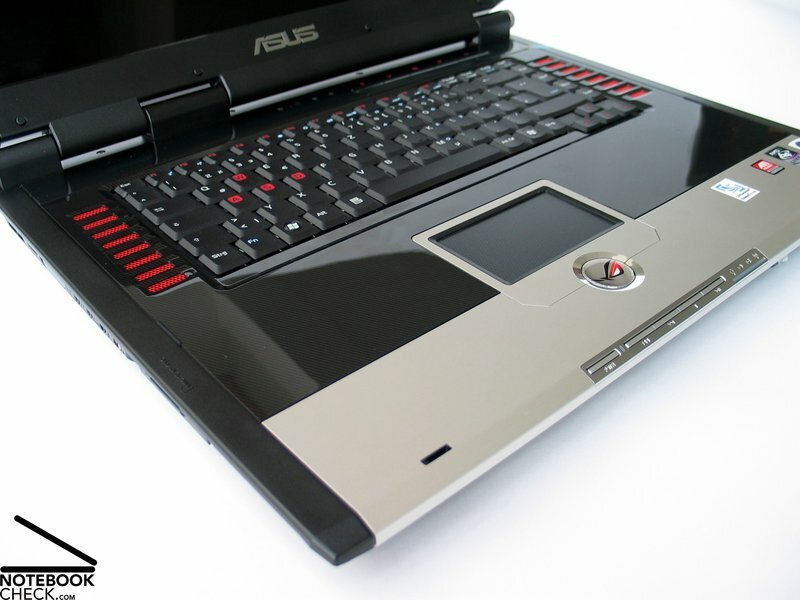 The Asus G2K is a cheap 17 inch desktop replacement that can be called as a gaming laptop. 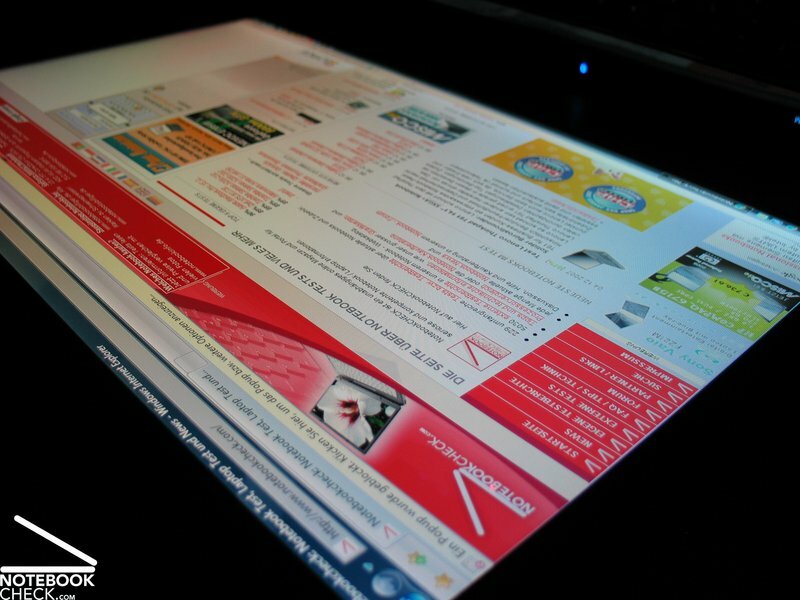 A characteristic of this device is obviously the unique design offering a very colourful surface and glowing lights on the display corners. Apart from the chassis design, the finishing is pleasingly well made that result in a very solid construction. 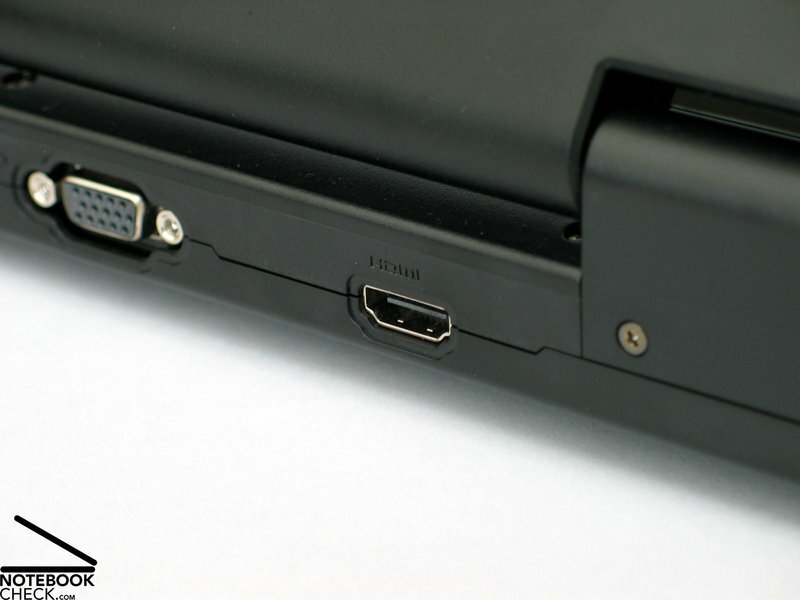 Moreover, the very generous accessory does really convince - HDMI and E-SATA are only examples. 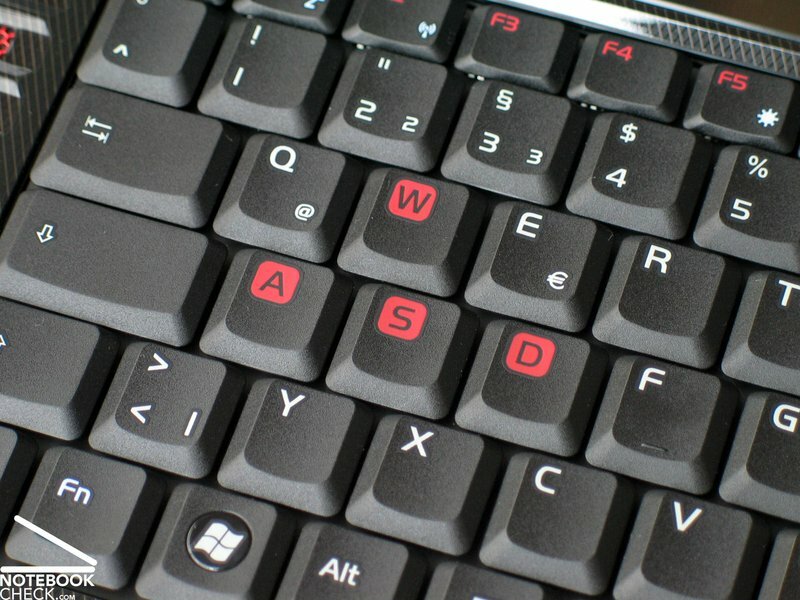 Also the input devices reflect the targeted gamers' market due to the outstanding A-W-S-D keys. There is a shiny G2 logo between the two touch pad buttons contributing to the overall nice design. Besides, we were pleased that the design did not reduce the usability of the Asus G2K and all in all the input devices performed quite well. 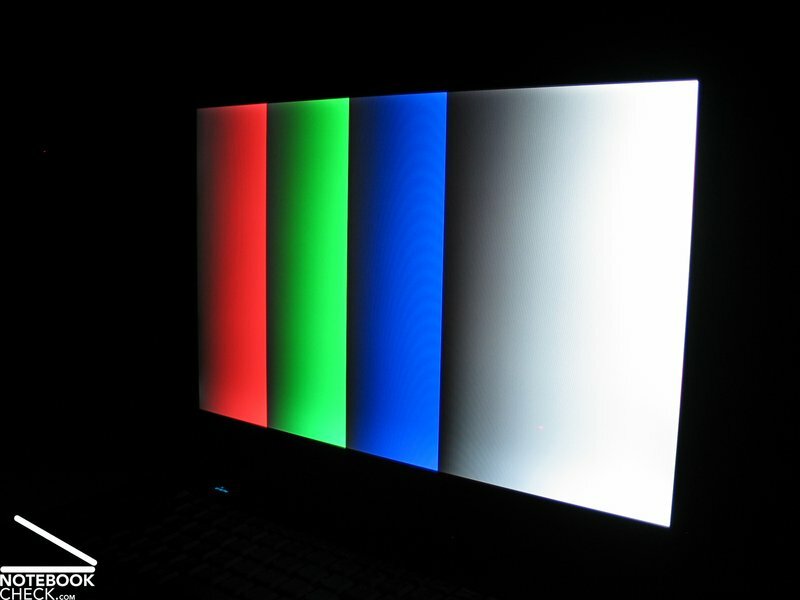 The display offering a resolution of 1440x900 pixels did very well in the test and delivered excellent brightness and contrast results. The subjective expression of the panel was very good, too that is mainly owing to the nice and strong colours. Although the performance of the hardware was not that convincing, it is still capable to enable playing latest games with some quality restrictions. This also occurred when using office application. 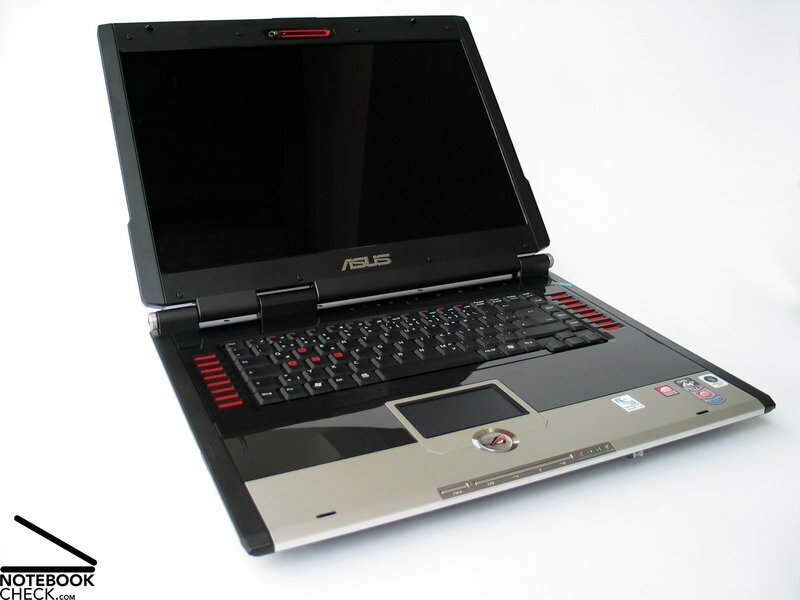 Especially positive was the extremely low noise emission of the Asus G2K. 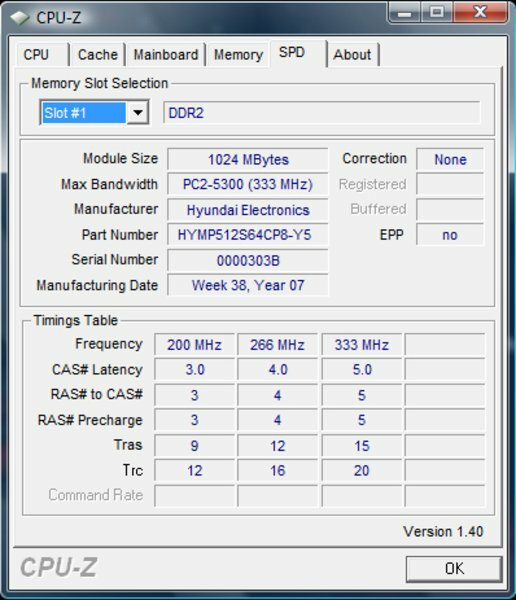 While being almost silent in the idle mode, the G2K only produces less annoying noise under full load. Nevertheless, this is countered by the exorbitant surface temperatures. 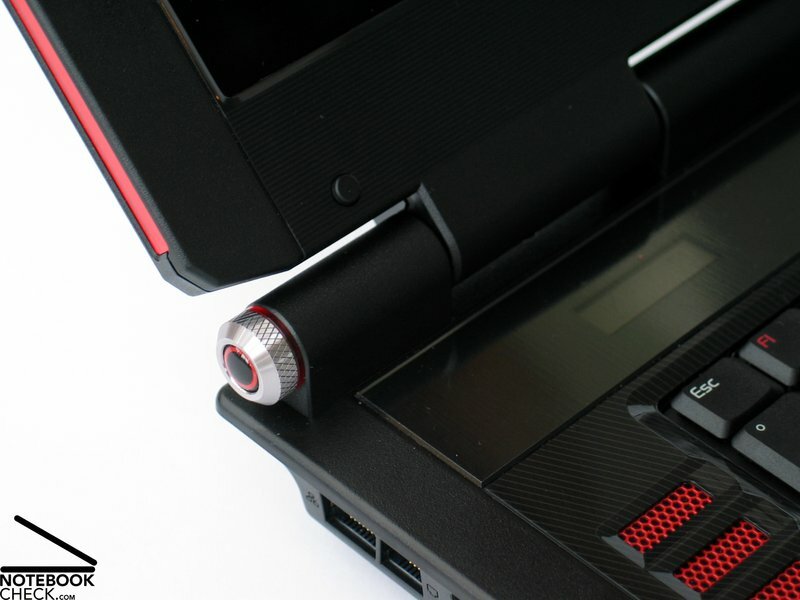 On the bottom side the temperatures almost reached the critical 50 °C limit with 47 °C and users will notice the very warm top of the laptop when using the keyboard. Despite the fact that the battery runtime was less impressive and is not very important for a DTR, a maximum of 2.5 hours should make occasional mobile use possible. 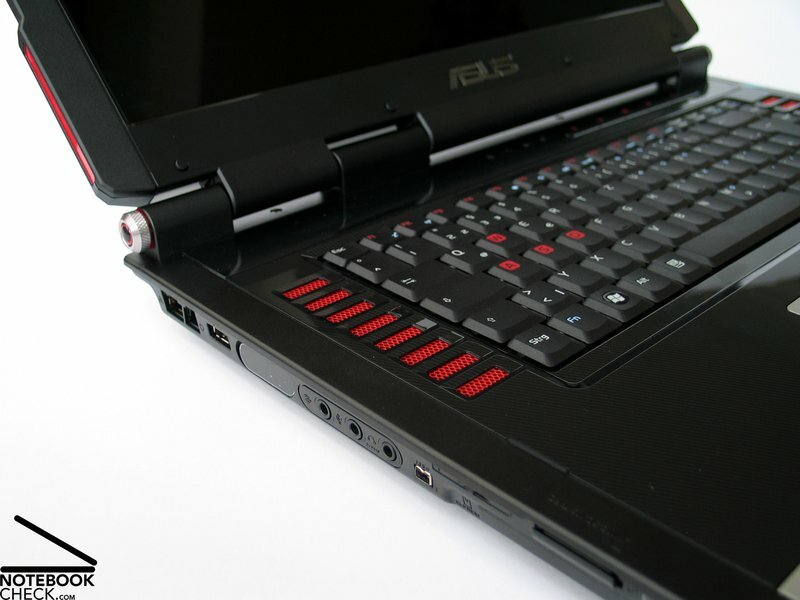 The G2K is another model of Asus' gaming laptop series. 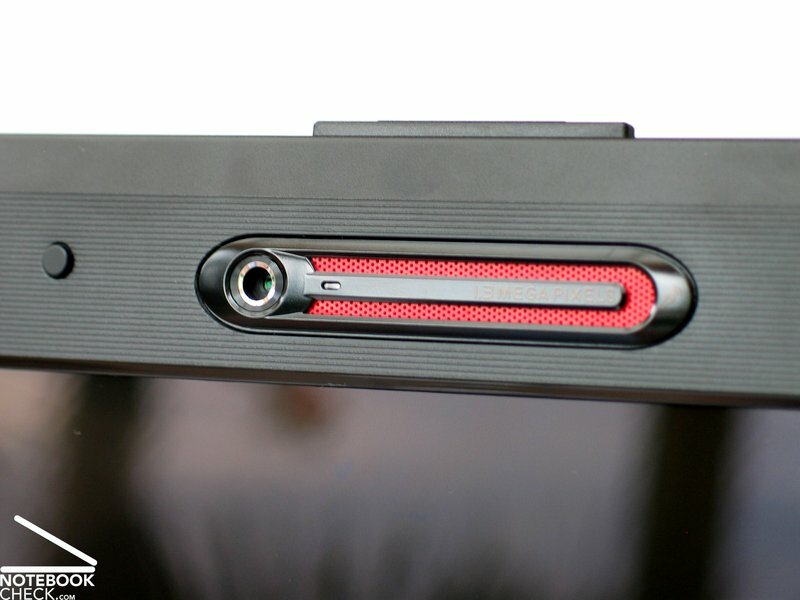 A 1.3 megapixels webcam is also included in this bundle. 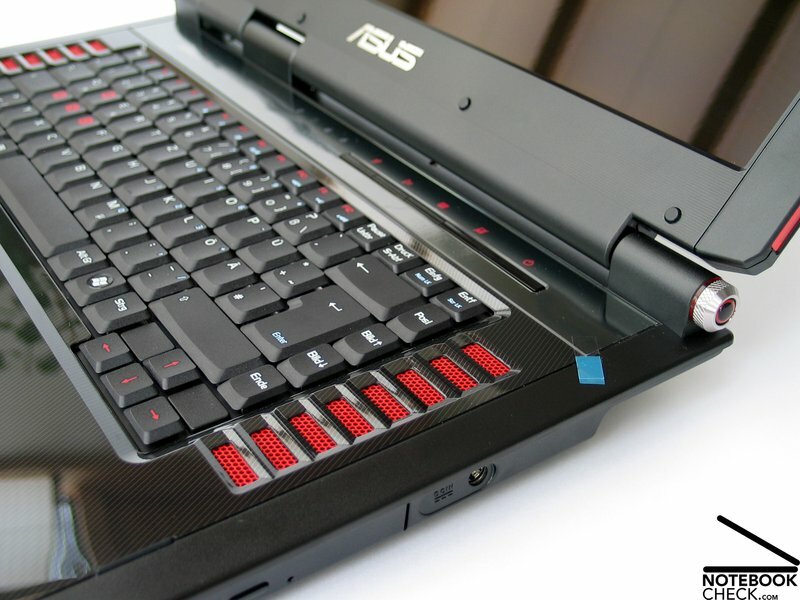 The G2K is kept in a gamers-like design and is comfortable to use. 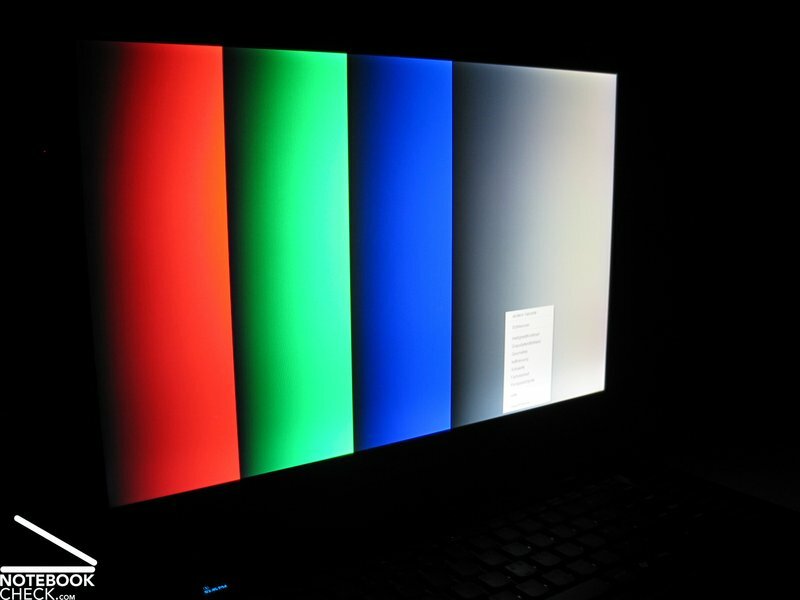 ...delivered excellent results in terms of contrast and brightness. 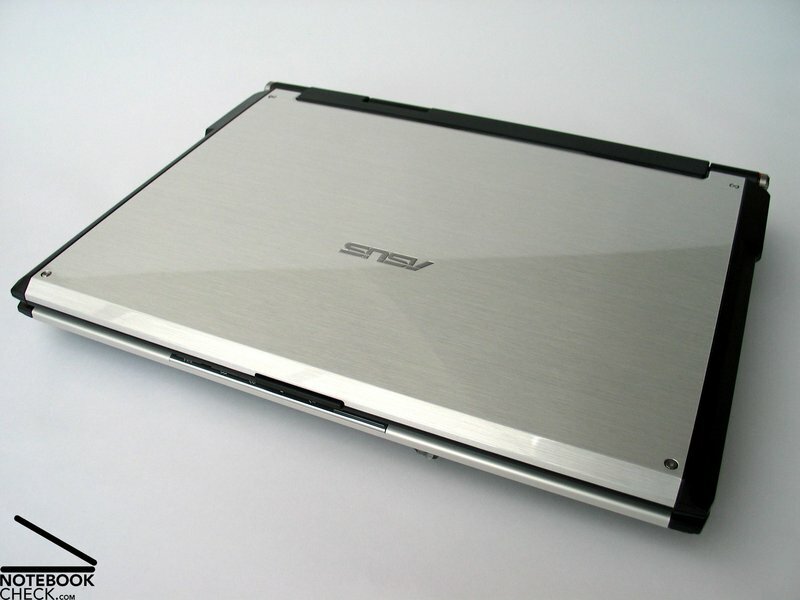 In contrast to most mainstream notebooks, the Asus G2K is equipped with an AMD CPU and an ATI graphics card. 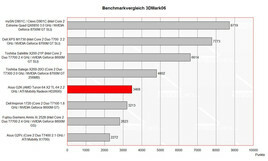 The Turion 64 X2 CPU and the ATI HD2600 attained moderate results in the benchmarks. The fan was always pleasingly quiet. This might has caused the maximum temperature of 47°C of the bottom side. The internal speakers were alright. An HDMI and a E-SATA port are amongst them. ...that are mainly located at the rear and the left side of the device. The case is based on the existing laptops (G2P, G2Pc), and thus presents the same striking decorations. ...or the flashing lights on the display corners. ...an example is the aluminimum moulding around the panel. ...places average with 4 kg total weight. ...do their job very well. 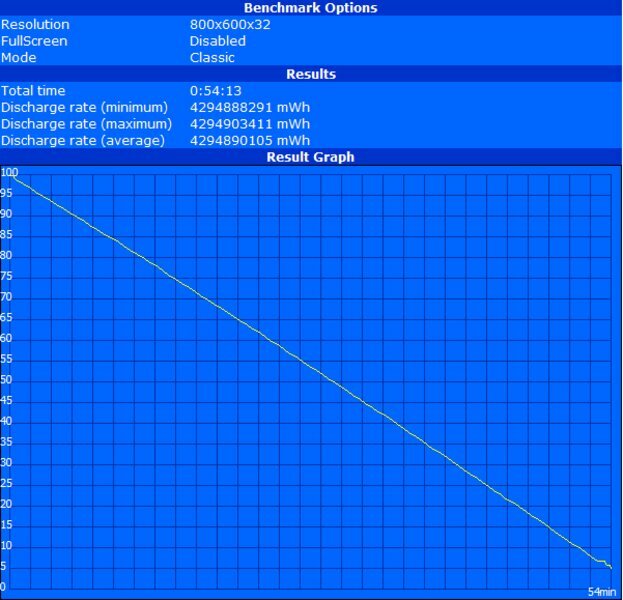 Last but not least, the overall battery runtime was about average in the DTR section.